Happy Friday! As we wrap up the week, it was cold, but productive. I posted a lot of this week’s activities earlier in the week, but there’s a bit more to talk about today. Right now it’s a whopping 9 degrees outside. That’s so cold, it’s a hand warmer day! There’s just nothing like hand warmers to keep your hands warm during farm chores on a cold morning. If you’re in need, pick some up here: HotHands Hand Warmers 10 Pair Value Pack . Another issue we face in cold weather is that livestock water freezes quickly, and then needs replacing. The water freezes in the water bucket overnight, and then every morning I have to knock out what is effectively a giant ice cube. I then refill the water bucket with fresh water. It might get a thin layer of ice on it during the day, but usually that layer is easily broken by tapping the side of the bucket during midday or evening chores. Overnight the water freezes, and I repeat the process the next morning. Morning chores take longer on freezing days because I must empty all the waterers, and carry out buckets of water to refill everything. 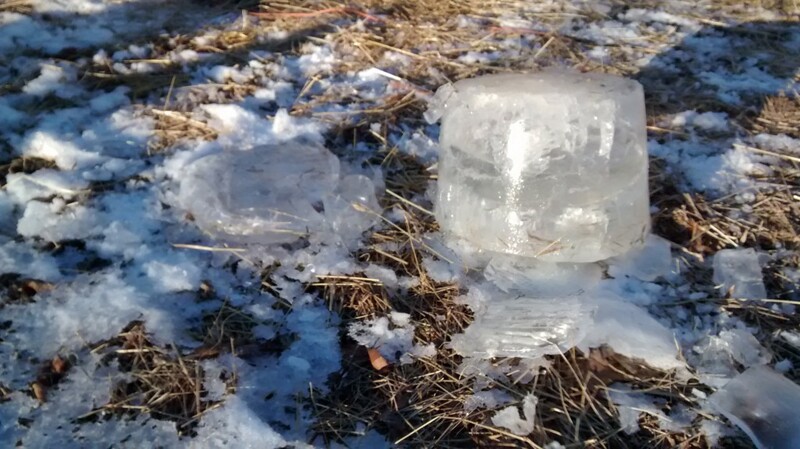 If the temperature is low for several days, the yard gets littered with ice chunks like the one in the picture! In the winter we use rubber feeder pans for water. 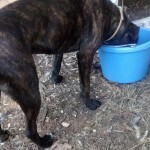 Check out what I mean here:Fortex Feeder Pan for Dogs and Horses, 3-Gallon . The rubber won’t break when the water expands as it freezes. Plus the flexibility of the rubber means it won’t break when I flip the dish over and stomp on it to break up the ice and get it to fall out. While there are heated water buckets available, they require having electricity out by your livestock. Since we practice more of a rotational grazing setup than a barn-based approach, I don’t see it ever being feasible to have electricity in the animal pens. 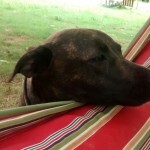 For a while now I’ve wanted to write a bit about our farm dog Whiskey. She’s a Catahoula mix that we picked up from a rescue organization right before moving out to the farm, and she has been the best farm dog. 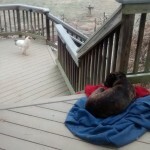 A few of the qualities that make her so great is that she has no prey drive with any of our livestock, even the chickens, and she seeks to protect the livestock. 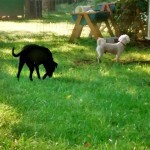 So many dogs are bred for hunting and retrieving, and then they try to “retrieve” chickens. We know a lot of people that have had chickens killed by their own dog. 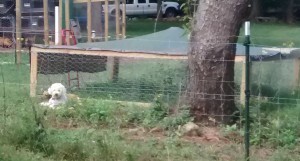 Whiskey has never had any actions that appeared to harass or threaten the chickens. With all the livestock, she continually tries to protect them from predators or whatever she perceives to be a threat. Of course it’s impossible to get a picture of Whiskey in action, but here are a few examples of her behavior. 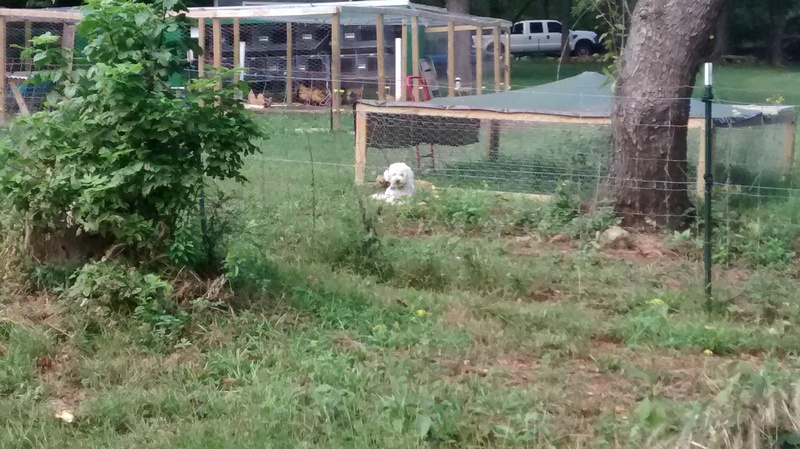 See that chicken tractor sitting right behind Noah (the fluffy white dog)? We grow out meat chickens in that, moving the whole thing, with the chickens in it, to fresh ground daily. When we move it, sometimes Noah gets really excited and runs around the tractor, barking at the chickens. When he does that, Whiskey gets between him and the tractor, and mirrors his movements so that she is between Noah and the chickens. She’s protecting her flock! Whiskey patrols the yard nightly, and often seems to scare away predators. 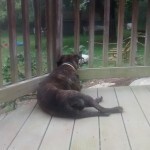 She has also chased away a bear from the backyard on at least one occasion. She saw it by the fence, and started barking and running toward it. It ran away. We have also seen her tree an opossum, too! Whiskey does all this livestock protection while still being a sweet dog that loves people. 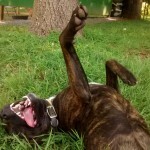 We are so happy to have her, and we highly recommend adopting a Catahoula for your homestead!